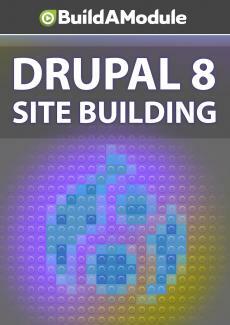 Solutions for chapter 8 of "Drupal 8 Site Building"
Looking for answers? Well, here's at least some of them. Okay and here are the answers to the quiz. Question one. Anonymous users can post comments by default, true or false? The answer is false. We had to add a permission in order to allow them to post comments. Question two. What do you need to do to enable commenting for a content type? Check all that apply. The answer is just D, the rest of these are kind of tricky, let's talk through them. A is turn on comments in a content type edit form. Comments are actually a field, so they're not turned on, but in Drupal Seven you would do it this way. B, install the Disqus module. This actually could be part of the answer, but it's not a super good one. If you are going with Disqus comments, you will need to install the Disqus module. So if you selected B as well, you don't have to consider it a wrong answer. And then C, add permissions to allow users to post comments. Those permissions don't really have anything to do with enable commenting for a comment type. This relates to who uses comments, rather than enabling comments for a content type. Okay question three. What is taxonomy in Drupal? Check all that apply. The answer is A and B. Another term for categorizing content, and B a collection of vocabularies. D is close, but you probably figured out that this is taxidermy, not taxonomy. Question four. The libraries folder is part of the default Drupal installation, true or false? And the answer is false, we have to create that ourselves. And question five. The Colorbox module does what? And the answer is B, provides a way to display large images in an overlay when thumbnails are clicked. Now let's look at the solutions to our challenges. So the first one was, remove the subject input from the comment form. To do this, we're going to need to modify the comment type. So let's go to Structure, Comment types, and Default comments. Let's take a look at the fields. So the fields just include the comment body. So it doesn't look like we can remove the subject line here, let's take a look at Manage Form Display. So here it looks like we can disable the subject. So let's drag it down to disable, then click Save. And now let's take a look at the comment form. I'm going to refresh our Incognito window. So for an anonymous user, they'll just see the name and comment inputs. Alright, not too hard. Our second challenge was figure out if it's possible to do the following. Add a new comment type that only staff with a certain role can add and view to discuss blog posts. So this could require several pieces. We would need a new comment type, we would need to add a field to the blog posts for that comment type, and then we would need to add a role and would add a permission to allow users of that role to view and add those comments. So first, let's add a new comment type. We'll go to Structure, Comment types, and we'll click Add Comment Type. And let's call this Internal Blog Discussion. This let's us set the entity that we're commenting on, in this case we'd want it to be content. Let's click Save. Okay, so now we have our custom comment type, let's add a field to our blog using this comment type. So we'll go to Structure, Content types, Blog entry, Manage Fields. Let's add a field, and we'll create a new Comments field. We'll call this Internal Discussion, and we'll click Save and Continue. For the Comment Type, we'll select Internal Blog Discussion. And click Save Field Settings. We'll leave everything at the defaults and click Save Settings. So the final part is adding a role, and allowing only users with that role to be able to view and edit these comment types. And this is where we're going to run into a problem. Let's check out Permissions. We go down to Comment. You can see that unlike Content, we have no granular permissions for comment types, they're global. So if a user can view comments and post comments of one comment type, they can do it across all comment types.